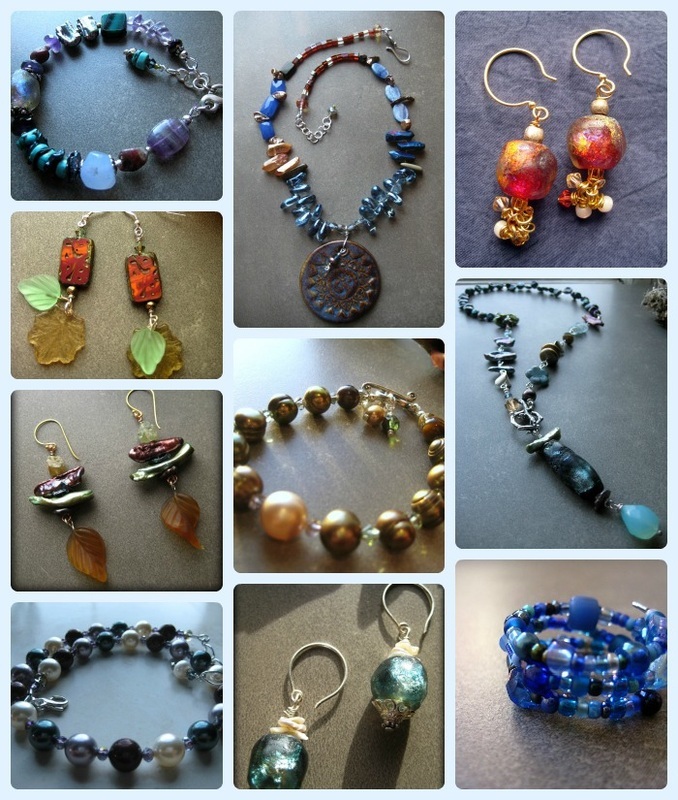 This Fall jewelry sale was a good time and place to try out different designs. The earthier pieces went. New designs include longer earring dangles with more color, texture, and bling. Classic Faux pas: it was truly a ‘little sale’: I panicked setting up, realizing my selections may be too slight, despite the extras I made and added to shop inventory. Each necklace has beads that vary in age- from the 1600’s to present day from all ends of the globe. Consensus was to make these necklaces longer than princess or collier length. Check. Sea from Space. Finally got some Roman glass to play with, which of course looks great with Basha’s beads. I have collected some amazing fetishes, stones, and shell from Native sources over the years, like this onyx raven with lapis, turquoise, and shell heishi. Experimenting with leather designs, and will be adding a few to the shop soon. And these, simple polymer dangles from HappyFish: not sure what happened… this isn’t normally a design I would wear, but I just can’t part with them! They are super lightweight & look great on. Good things about this sale: sharing the weekend with seamstress friend Elma who makes awesome textiles- Dia de Los Muertos pillows & an amazing Frida quilt! The photos didn’t take- so I will snap some in better light & repost. like these pieces that found new homes: Night Music. is a fire necklace of Lava, Raku, torched glass. I fell in love with this piece when making it: bone ash Raku rounds (Wondrous Strange) with vintage deep red Basha bead nuggets- truly different from her current work in shape and color. This was my first knotted necklace using waxed cord. Mystic Mandala: BlackMud Studios pendant, and favorite blue stones and glass.